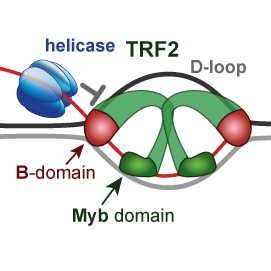 We explain how telomeric proteins TRF2 and RAP1 modify BLM helicase activity and processing of displacement loop (D-loop) during replication of telomeres. We addressed the role of the basic domain (B-domain) of TRF2 in the stabilization of DNA loops. We suggested a mechanism for how the B-domain stabilizes D-loop and how RAP1 reverts the stabilization. Our quantitative functional studies explain how telomeric proteins cooperate in order to selectively recognize human telomeric DNA. We investigated human Rap1–TRF2–DNA interactions by quantitative approaches. Our findings could be applied on all proteins that recognize DNA selectively and preserve genome stability. These quantitative observations describe how the TEL-patch part of telomeric protein TPP1 stabilizes telomerase on telomeric DNA and explains its contributions to telomerase recruitment and action. Stay informed. Hot news and breakthroughs directly into your mailbox. One email per three months at most.